Around the Clock Medical Alarms state of the art compact unit design is sleek and attractive to fit anywhere in your home. Equipment made in the USA. We are the only company that manufactures and monitors our own equipment in America. Our advanced unit is the first in the industry to be fully compatible with standard, VoIP, cable and magic jack phone systems. Automatic Testing. Our advanced and cellular units automatically call into our response center every seven days to notify us everything is working properly. Also, if the unit loses phone connection our monitoring center will be notified. Battery Monitoring.The advanced and cellular units have a 90 hour backup battery system in the event a home loses power. Speaker/Microphone. The advanced and cellular units provide the best sound quality in the industry today and is able to communicate with a senior anywhere in a home smaller than 3000sq feet. Again, why Around the Clock? Our systems allow you to remain independent in the comfort of your home while having the peace of mind knowing that help will be there when you need it most. 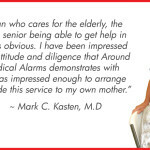 https://www.aroundtheclockmedicalalarms.com/wp-content/uploads/2015/10/featured3.jpg 460 960 admin https://www.aroundtheclockmedicalalarms.com/wp-content/uploads/2018/10/logo-300x72.png admin2018-05-01 00:55:012018-03-19 17:59:08Why Around the Clock? Help. Any Time. Any Day. Any Reason. You Don't "Have to FALL" ... to be "Alarm Appropriate!"